DUSHANBE -- As part of Tajikistan's annual anti-drug Operation Kuknor (Poppy), authorities plan to install mobile and fixed check-points throughout the country. By the end of July, they expect to complete setting up check-points along highways and at railway stations and airports, said Drug Control Agency (AKN) spokesman Khushnud Rakhmatullayev. "Members of the AKN and Interior Ministry (MVD) will search vehicles, baggage and passengers for narcotics," he told Caravanserai. The annual two-phase operation runs from May 20-August 30 and September 1-November 30. Participating forces include the Border Troops, State Committee for National Security (GKNB), AKN and MVD. The operation's main goal is to shut down drug-trafficking routes between opium-producing Afghanistan and Tajikistan, hopefully ending Tajikistan's status as a transit corridor for drugs, Rakhmatullayev told Caravanserai. 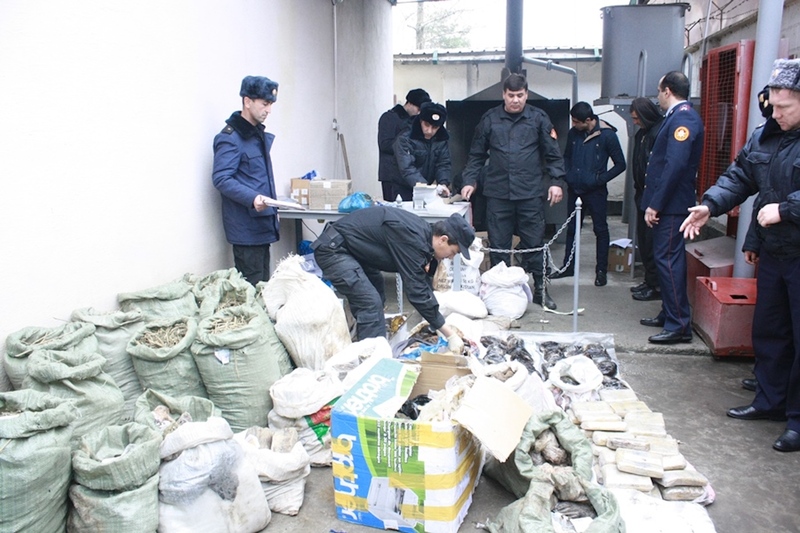 The operation takes place in summer and autumn because during those seasons cannabis grows and drug producers are busy making narcotics, said Rakhmatulloyev. The operation involves AKN and other security personnel inspecting every farm to turn up any plantings of cannabis, he said. They destroy all such plantings that they find. Authorities are seizing fewer drugs than in past years, an encouraging sign of falling traffic, said Rakhmatulloyev. Law enforcement confiscated 2,134kg of drugs during the first five months of 2017, according to the AKN. That figure actually represents a slight increase compared to the same period in 2016: 1,995kg. However, in all of 2016, total drugs seized equalled 3,426kg, down from 4,676kg in 2015. "After the Taliban established themselves along the Tajik-Afghan border, the Tajik authorities tightened up the border," Rakhmatulloyev said. "The drug smugglers moved to other routes." "We already see cases of drug smugglers being caught inside Iran and Georgia," Yusuf Rakhmatov, a Dushanbe specialist on security issues, told Caravanserai. "This means that the 'Northern Route' [for drug trafficking] through Central Asian countries has lost popularity." The Border Troops' goal for Operation Kuknor this year is to thwart smuggling by securing the border, said Border Troops spokesman Mukhammad Ulugkhojayev. "In addition, our job includes detaining drug couriers, illegal border crossers, and those who violate border regulations," he told Caravanserai. "The Border Troops ... are carrying out all their assignments successfully. It is every Tajik citizen's sacred duty to protect the border, he said. "The Border Troops ... are in a state of continuous combat readiness," he said of the force's attitude toward protecting the border and preventing drug trafficking. Seems like a good idea. Illegal drugs should be controlled as a matter of public safety. Also important to remember to allow people who have medical need access to medications for PERSONAL use as prescribed by a physician. Tajik authorities are concerned about new synthetic drugs, which are 'especially dangerous for youth', say specialists.